While it might look like Rock ‘Em, Sock ‘Em Robots on the outside, Nintendo’s next wacky IP ARMS has a lot more to offer than just oodles of slinky arms. As per the title’s dedicated Direct broadcast last night, here’s everything you need to know about ARMS. For more details about the ARMS Global Testpunch beginning May 24, head on to the bottom of this article. ARMS isn’t Nintendo’s first step into the world of competitive gaming, but it is another step into the realm of fighting games. Players will equip two arms—or weapons—of varying weights, attributes and styles and go head-to-head in a battle of whirring punches. The first one to lose all their HP loses the battle. The ultimate goal? Winning, of course. The game promises to provide thousands of different ways to change the tide of battle, from different characters with special abilities and specialty arms, a huge variety of arms with different looks, weights and elements attached to them, and combinations. Grand Prix: Not quite a story mode, not quite multiplayer arena. This can be played both alone and with a friend. The first to win 10 matches in a row (with challenges included) will be crowned ARMS Champion of the Universe. OK, maybe not ‘of the universe,’ but champion all the same. Versus: Traditional, head to head knock-‘em-out goodness with up to four players. Bomb and healing items will drop into the arena during battle, and during 2v2, allies are chained together. And yes, there’s friendly fire. Party Match: This four-way online only mode take everything you love about socking the crap out of your friends, and turn it into a series of mini-games. Or, go ham and open up a lobby that can support ten systems with two players each. Your call. Ranked Match: Online multiplayer at its finest. These online one-on-one battles risk it all—winning boosts your rank, and losing throws you back down. Local Multiplayer: If internet gaming just isn’t your thing, play in local wireless mode with a buddy nearby. They’ll have to have their own Switch(es), but head-to-head battle and party matches are available in this mode with up to eight systems. Those crazy slinky arms come in three weights: light, medium and heavy. Each effects momentum, so lighter arms will move faster, but do less damage, and heavier arms will move slower, but do more damage. Arms can cancel each other out if they’re the same weight, or heavier than the other. Arms of the same weight will cancel out punches entirely, whereas heavier punches will move right on through the lighter weight ones. All Arms will have one of seven different attributes—fire, electricity, wind, ice, stun, explosion and blind—these haven’t been confirmed to act as character weaknesses and strengths, but they act as status effects to bring down your opponents once they are charged up. And you aren’t limited to using Arms as a set, either. You’ll be able to equip whichever Arms you want for both left and right. Arms will be able to be earned in-game by playing matches and earning coins. Spend those earnings at the Arm Getter. Play a little mini-game and earn a randomized Arm. Duplicate Arms will strengthen Arms. 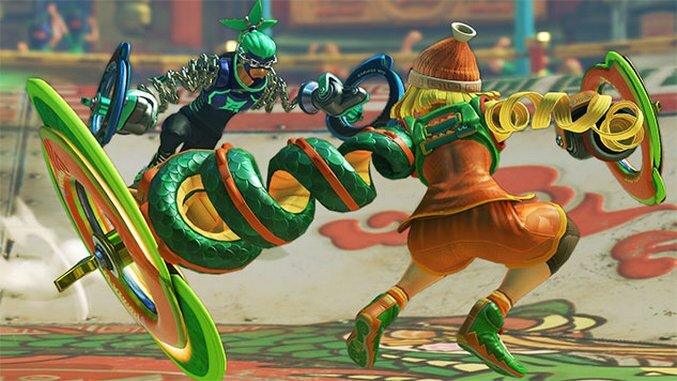 ARMS will launch with ten unique fighters and is expected to have free content updates as time goes on to expand that roster. Each has their own special ability and three sets of arms that they specialize in. Choose them carefully—your strategy will depend on it. Spring Man: Once you get past his bright, blue toothpaste hair, he’s pretty rad. His ability is the shockwave, a dash that reflects attacks, and when he gets weaker, he only gets stronger. His signature Arms are the Toaster, Boomerang and Tribolt. Mechanica: The odd one out of the bunch, Mechanica is the only fighter that isn’t naturally an ARMS fighter—she’s a human in a fighting suit. As appearances show, her suit’s a tough one to crack, and can hover around the arena. Her signature Arms are the Revolver, Whammer and Homie. Ninjara: This college ninja is lightning fast with abilities that let him disappear and warp around the battlefield. Equip him with the Chakram, Ruff or Triblast. Master Mummy: Your furious punches won’t faze this fighter. He’s a heavyset tank and when he’s guarding, he heals. He’ll do the best with the Megaton, Retorcher and Phoenix Arms. Kid Cobra: He may look sssneaky, and he is. This fighter has the ability to dip and dodge quickly, and strike hard. The Slamamander, Hydra and Coolerang are his specialty Arms. Ribbon Girl: This bounding pop star is just as bubbly as she is bouncy. She’s a quick and jumpy fighter who can get up fast and down just as easily. Her signatures are the Sparky, Popper and Slapamander Arms. Min Min: Punches are nothing to the “ramen bomber”’s spin kick. Charge up her left arm and throw out a dragon, you know, just like normal. Watch her throw down with the Dragon, Megawatt and Ramram Arms. Helix: This flubber-like fighter was a happy accident. Instead of just stretchy arms, his whole body stretches and flies around the arena. Throw the Blorb, Ice Dragon and Guardian Arms on him to bring everyone down. Byte and Barq: This robo-cop duo are unstoppable. Use Barq to give Byte a height advantage, or as a decoy. Or, watch them go Devastator and combine for their special attack. Equip them with the Seekie, Cracker and Bubb Arms to divide and conquer. Twintelle: The silver screen isn’t enough for this A-list actress. Her platinum pigtails act as her Arms, and of course, those looks stun her opponents while charging. She’s strongest with the Chilla, Parasol and Thunderbird Arms. Get a chance to try ARMS before it launches on the dates listed in the infographic below – snag it in the eShop now.